Club hockey has been played in Kingston since 1892 when the Kingston Hockey Club played for a season on the Fairfield behind Kingston Grammar School. Changing was at the Cricketers, overlooking the pitch, starting a tradition of using pubs that has its echoes today! The team included Old Boys and Staff from the School, many of whom also played cricket for Hampton Wick Royal Cricket Club, by then well established in Bushey Park so the next season the Kingston Hockey Club became the Hampton Wick Hockey Club and moved over the bridge. Changing was now in the Rose and Crown in Hampton Wick High Street, an arrangement that lasted from 1892 until 1939 with breaks only during the Boer and Great Wars. The relationship with Kingston Grammar was cemented in 1908 when, at the then Headmaster’s request, the name was changed to the Kingston Grammar School Old Boys Hockey Club by way of encouraging school leavers to join. It is in this guise that we celebrated our Centenary in 2008. The next name change came in 1920 with the adoption of the Old Kingstonian Hockey Club when the local football club, called the Old Kingstonian Football Club, folded. And finally, technically the “Old” was dropped in 1979 when the Club went open, but we are still known to all and sundry as The OK’s. But perhaps the most important benefit of “going open” was the ability to form a Ladies section. This was accomplished in 1989, since when they have become an integral and much valued part of the Club. Over these years, the Club may claim to be one of, if not the, most successful of all hockey clubs. Since the last war we can claim 22 Internationals, 8 GB and 5 Olympic players not including those OK’s of more recent vintage who have played their club hockey elsewhere. On one Saturday in 1960, there were three OK players in different international sides! Regrettably, the current sides cannot claim quite such distinction – although a few ex-internationals can be seen in action (sic!) most Saturdays. Hopefully, the steps now being taken to secure first class facilities for the Club will enable us create the right environment in which to regain our rightful position in the Hockey world. The Scorpion Hockey Club owes its origin to a desire to play hockey on Sunday. That is not so stupid as it sounds today as playing games on a Sunday at that time was frowned upon in 1930. Many grounds were closed for sport on that premise alone. Rarely could the Hampton Wick ground be used but thanks to Arthur Hulland occasional access was obtained to use the Malden Wanderers ground at New Malden. In 1929/30 a fixture list was drawn up which can only be described as primitive. The Sunday fixtures were a great success and suggestions were made for the Sunday fixtures to be included in the regular fixture list of the Old Kingstonian Hockey Club. 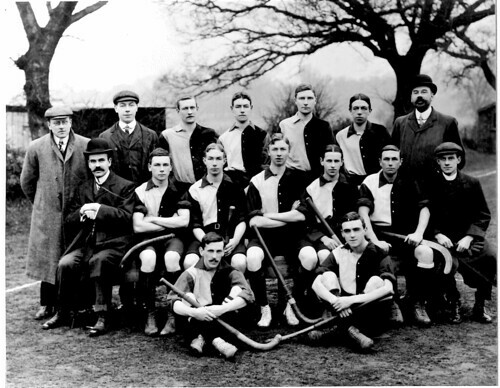 This was not considered possible as a number of Old Boys were members of the Hornets – largely sponsored by Dulwich H.C., so in 1930, fifteen OKHC members met at the Railway Tavern in Hampton Wick and decided to run a Sunday hockey side called the Scorpions. Arthur Hulland was to be captain, Leslie Whitbread vice, Norman Robinson team, Jim Denniford match Secretaries. And so the Scorpions flourished, and not at any time during the period 1930 – 1940 was it beholden in any way either financially or otherwise to the Old Kingstonian Hockey Club. There was no subscription. Any game played for instance at Hampton Wick or New Malden involving expense was paid for at the time. There was little hockey during the period of the Second World War, but after the war Sunday hockey became very popular and the Scorpion fixture list was incorporated into OKHC fixture card. In the 1950s and 60s the OKs used to run two Scorpion sides which were very successful. It had an extensive fixture list and played matches as far North as Norwich (the Grasilles), the South coast against (Littlehampton) and Devises (Moonrakers). The Scorpion v Hornets fixture was one of the highlights of the season with both sides packed with current international players, and drew a large crowd of spectators. The Sunday fixtures helped considerably with the economics of running hockey clubs. This was all pre-breathalyser and there were some good parties afterwards – the fixtures with the Hairy Goats of Maidenhead being particularly noteworthy. The Scorpions also used to play at the Worthing and other Easter Festivals and played in the Bloomendaal Festival in Holland. The changes in the hockey fixture list with the switch to artificial pitches and league hockey on Sundays brought about the demise of the Scorpions and most of the other Sunday sides. The better players could not participate on Sundays and artificial pitches were not available for matches. Sunday matches in the Scorpion era were certainly very popular. The changing hockey and social environment mean that it is unlikely that Sunday hockey of such a good standard can be played in the future on a regular basis.